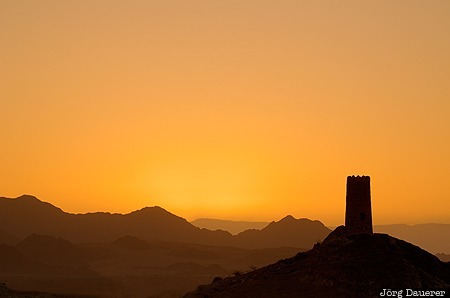 A colorful sunrise behind the silhouette of a lone decaying watch tower in the oasis Al Mudayrib at the edge of the Wahiba Sands desert (also known as Ramlat al-Wahiba or Sharqiya Sands). Al Mudayrib is in Ash Sharqiyah in the Sultanate of Oman. This photo was taken in the morning of a sunny day in March of 2012. This photo was taken with a digital camera.